Enjoy the monuments and other features of Jastrzebia Gora. Well known for its seaside, beaches and forests, this walkable city won't disappoint. If you need more space to accommodate a family vacation or friends trip, rental homes often come with separate dining areas and spacious living rooms. Fly into Gdansk (GDN-Lech Walesa), the closest airport, located 31.4 mi (50.5 km) from the city center. Where to stay around Jastrzębia Góra? Our 2019 property listings offer a large selection of 5 vacation rentals near Jastrzębia Góra. From 3 Houses to 2 Condos/Apartments, find a unique house rental for you to enjoy a memorable stay with your family and friends. The best places to stay near Jastrzębia Góra for a holiday or a weekend are on Vrbo. Can I rent Houses in Jastrzębia Góra? 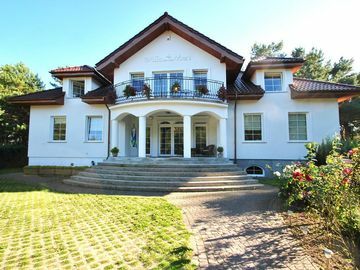 Can I find a vacation rental with internet/wifi in Jastrzębia Góra? Yes, you can select your preferred vacation rental with internet/wifi among our 5 vacation rentals with internet/wifi available in Jastrzębia Góra. Please use our search bar to access the selection of vacation rentals available.